The short answer to both questions is, of course: yes. The effects of joy and joyfulness include helping us live a healthier, happier, more engaged and more productive life. They are an antidote to the modern epidemics of anxiety, depression, isolation or disconnection. The science behind this gets stronger every day. “Humans do seem to be genuinely unified by laughter.” says Professor Sophie Scott of University College London. 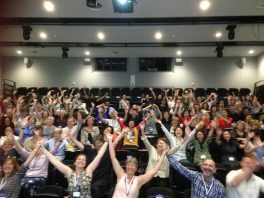 We probably need no other reason for laughter yoga than this sense of connecting with fellow humans in a warm, peace-inducing, good-natured way. “Laughter……. spurs not only creativity and collaboration but also analytic precision and productivity.”says Harvard Business School professor Alison Wood Brooks. These psychological benefits have been documented in positive psychology studies for some time (in ‘Authentic Happiness’, by Dr Martin Seligman, for instance), so the factual basis for more laughter in our life is solid. 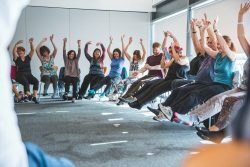 As part of the wellness and mindfulness waves that are, happily, spreading inexorably through modern life, there is a special role for laughter yoga. 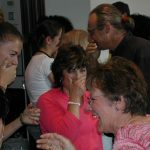 Laughter yoga treats laughter as a yoga because, as is increasingly well known, the benefits come from the act of laughter itself, not through jokes or humour or funny. A happy spin-off happens to be that life becomes funnier and more humourous but the intention is to access all the benefits from the act of laughter itself – for the reasons covered in the articles below. 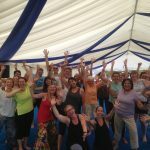 Laughter yoga is an adaptable activity. It works as effectively in teams & conferences as in classes, or on your own. It works seated or standing, for all ages and cultures. It can be used in any and all circumstances. 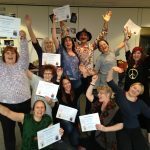 As there are so many benefits from laughter yoga, isn’t it time to explore its potential in your own life? 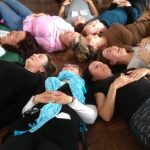 Do you want the free 7-minute Relax/Breathe/Smile/Feel meditation? 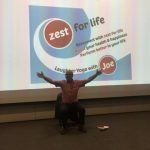 This entry was posted in Connection, laughter yoga, mindfulness and tagged anxiety, connection, depression, happiness, laughter yoga, mindfulness, positive psychology, resilience, smiling, wellbeing on November 26, 2018 by Joe Hoare. “People say that what we’re all seeking is a meaning for life. … I think that what we’re seeking is an experience of being alive…….so that we actually feel the rapture of being alive.” Joseph Campbell. 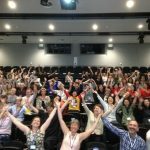 How do laughter yoga and moving mindfulness help us feel alive? One of the many effects of laughter yoga is to alter time, to expand the ‘Now’. When we laugh heartily, time disintegrates and the present moment expands. We become wholly involved in the moment, in the act of laughter itself. All our attention is engaged in this almost overwhelming activity and we enter an altered state of consciousness – the ‘Now’. When we live in the ‘Now’ as opposed to in the past or the future, we enter a state that is timeless and inherently joyful. When our attention and awareness are focused in the current moment rather than in our thoughts, memories and anxieties, we find the ‘Now’ is expansive and liberating state of being, and this can affect us profoundly. ‘I must agree that the session for the “Wild And Well” weekend was one of the best out of the whole course. Over the years I have found that mindful movement and embodiment can rapidly precipitate this. I have found the simple formula of moving, breathing and smiling, when adjusted appropriately, works with every group in every situation. It has worked with ‘grieving’ groups, with special needs children, and with hospice volunteers. When this approach is suitably framed, it allows and encourages effortless, good-natured, appropriate light-heartedness & playfulness. This always manifests as joyful, natural, genuine, spontaneous laughter. 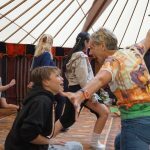 When this form of laughter yoga is combined with mindful movement and aware, conscious embodiment, our ‘Now’ expands in what is sometimes an intensely ‘alive’ experience. This hybrid approach uses the best of mindfulness and the best of laughter yoga. It works because they reinforce each other. 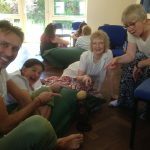 It is the combination of the ‘lightness’ of laughter yoga with the ‘awareness’ of mindfulness that produces this experience of being intensely and joyfully alive. One quality about this practice is its simplicity. Jon Kabat-Zinn described mindfulness as ‘simple but not easy’. 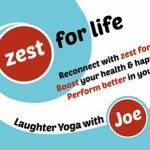 This combination of laughter yoga and mindful movement is simple. It is best done in the easiest and simplest way you can. There is nothing to learn. You simply start consciously moving, breathing and smiling, and feeling how this affects you. The more you do this, the more you build muscle memory and, through neuro-plasticity, wire this into your consciousness. The more you practice, the longer the benefits last. I hope you develop and enjoy your own practice. 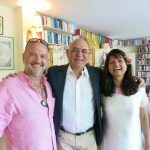 This entry was posted in enlightenment, Laughing Yogi, laughter yoga, mindfulness and tagged anxiety, connection, happiness, laughter yoga, mindfulness, resilience, smiling, wellbeing on November 2, 2018 by Joe Hoare. 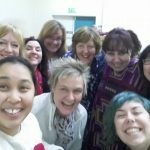 Laughter yoga – laughter as yoga – what’s the big deal? Possibly it is the biggest deal. So much human life is characterised by over-seriousness and over-thinking. We have probably all experienced both, regularly. Possibly we still do? Does it serve us? What goes better in our life when we are over-serious and/or over-think? If it doesn’t serve us, and we recognise it doesn’t serve us, how can we stop? How can we learn not to be over-serious and not to over-think? The answer is practice – practicing not being over-serious and not over-thinking. It is only a question of practicing enough so we learn new reflexes. Psychology, medicine, science all show how our quality of life improves when we reverse this trend. Our own personal experience affirms this. We know this. Every time I ask people how they feel after smiling and laughing, the answer is always: ‘better’. I experience this myself. I am aware how the practice of self-initiated smiling and/or laughing (ie without jokes, humour or any external stimulus) calms me down and also has the immediate effect of reversing over-seriousness and over-thinking. It helps me deal better (ie more effectively) with stresses, anxieties, irritations. It helps me communicate better (more effectively, peacefully, with greater compassion and understanding) both in person and through social media. It helps me connect better with myself and with others. Self-initiated smiling and laughing are core practices in laughter yoga. We smile – just because. We laugh – just because. When we use laughter yoga self-initiated smiling and laughing, we get multiple benefits. Our decision/choice to do these is instantly life-affirming in this Victor Frankl way. This in itself makes us feel better. Additionally, there are the many measured biological and biochemical and neurological benefits. These can make us feel better. Additionally, we immeditately start to connect better. We can create a virtuous circle of choosing to feel better, which makes us feel better, which helps us connect better, which then makes us feel better because we are feeling better and starting to get better feedback from others, and so on. 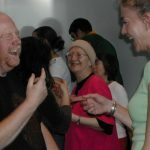 All this can be triggered by simple laughter yoga smiling and laughing exercises which are fun to do, easy to learn, and can be done on your own. They are at the heart of the #laughteryogawithJoe experience. 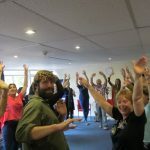 This entry was posted in Laughing Yogi, laughter yoga and tagged anxiety, connection, depression, happiness, laughter yoga, mindfulness, positive psychology, smiling, wellbeing on July 16, 2018 by Joe Hoare.